Eating a healthy diet is always a good idea, especially during pregnancy, but since falling pregnant 32 weeks ago, I’ve taken a pregnancy supplement every day without fail to help cover any nutritional gaps in my diet. Even with the most solid diet, it’s extremely difficult to make sure that you’re getting enough nutrients for both you and baby. 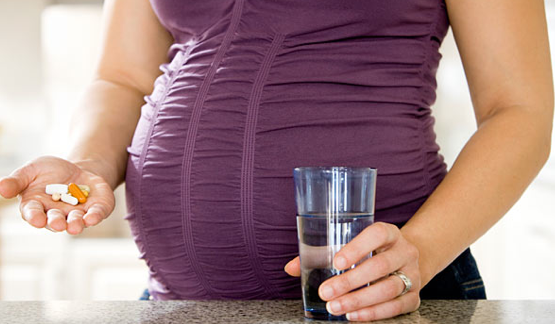 While I don’t recommend going crazy with the supplements, there are a handful that have been shown to help with pregnancy and your baby’s health. 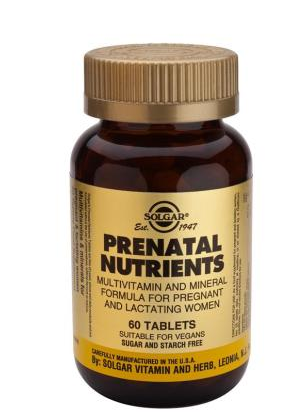 Solgar is a brand I’ve always trusted and I took these for a good few months before I fell pregnant. The NHS recommend you have 400 microgram of folic acid every day while you are trying to get pregnant and until you’re 12 weeks pregnant, which is why I like this supplement. Each tablet has the perfect amount of vitamins/minerals, without exceeding 100% of the recommended daily allowance (RDA), except for iron (which is supposed to be higher for pregnant women anyway, to help fight fatigue). 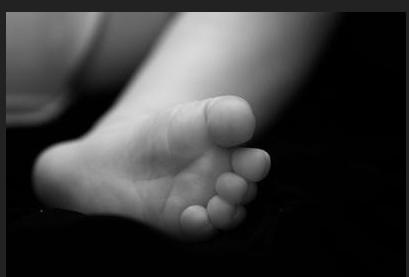 It also had an adequate level of folic acid, which as I said before is extremely important prior to conception as the neural tube develops in the first 30 days of pregnancy (before most women know they are pregnant) and supplementing folic acid can prevent many cases of conditions like spina bifida. I like this brand because it has a healthy amount of DHA, which is vital for helping your baby’s brain develop. You can get DHA from eating fish such as salmon, sardines and herring but what with my morning and afternoon sickness, the last thing I wanted was fishy fish! It also contains a healthy dose of vitamin D, which is good for regulating the amount of calcium and phosphate in the body, and is needed to keep bones and teeth healthy. The NHS recommend you take a supplement of 10 micrograms of vitamin D each day when you are pregnant and if you breastfeed to provide your baby with enough vitamin D for the first few months of its life. 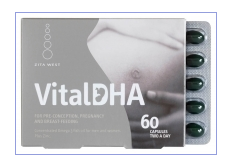 I knew of Zita West, since I had read many of her books when planning to conceive, so it was a no brainer to try her supplements, which are tailored to suit each trimester. You take one, three times a day with food and they will then provide you with everything you need to safeguard your everyday diet, including 400mg of folic acid plus lots of protective ingredients such as Beta Carotene (a safe way to help support your intake of vitamin A), copper, magnesium, manganese and zinc, all of which support normal cell division and help to protect DNA. I also brought her Vital DHA, which you have twice a day and contains Omega 3 essential fatty acids (necessary for baby’s brain development, and to ward off inflammation), plus a small amount of zinc. Please speak to your doctor or health adviser before taking any supplements. I thought I would share my food and training diaries with you. Now I’m in my second trimester all my cravings seem to have disappeared and I’m near enough eating what I used too. So here are my food diaries for you. They aren’t perfect but I’m hoping they will help other people eat well and keep me on track too! 9:30am Sunwarrior protein shake with natural greek yog, coconut water, chia seeds, banana and almond butter. 30g oats. 8:30 Chill con carne with organic lean beef and vegetables. Greek yogurt with Cherry Compote to finish. 9:30am Sunwarrior protein powder with banana, coconut water, chia seeds and almond butter smoothie. 35g oats. 11am I then had some chocolate. I do have an excuse though – bubs hasn’t kicked all day so I phoned the NHS helpline and they told me to have some sugar (Cudburys Heroes were my choice of chocolate!!!) and lay down on my left side for a an hour or so and relax. I think that woke her up but the kicks are very light so I’m hoping all is well in there. 6pm chicken with salad followed by Greek yog and cherry compote to finish. Omega 3 is the buzz word these days. And for good reason. It helps fuel every cell in your body including your brain and heart, while lubricating your joints and helping build lean muscle tissue. I love chia seeds because it is full of it! 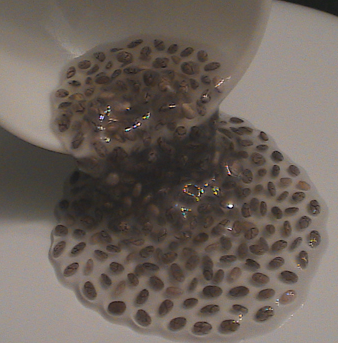 These tiny little seeds that look like frog spawn when soaked in water also absorbs 16 times its weight in liquid, making them really filling (think of the room these are going to take in your stomach) and full of nutrients. To eat them, I’ve been soaking them overnight in filtered water. I then add them to my smoothie or juice in the morning. Despite looking a bit slimy and gross, don’t be put off. They don’t taste of anything, yet will provide Omega 3, fibre and protein (which contains all eight essential amino acids), vitamins and antioxidants to power your body. As well as adding to my juices, I’ve also tried making a breakfast chia seed pudding by simply tossing together chia seeds, coconut milk, blueberries, shredded coconut and sliced almonds in a bowl and letting it sit overnight in the fridge -it’s lovely and so filling and easy to eat! It’s good for my growing baby too! The omega 3 is great for a supporting my placenta, while the complete protein is essential for every cell in your baby’s body. 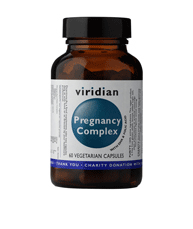 The fibre helps things run smoothly too, especially as constipation can be very common in pregnancy. Add a tablespoon of soaked seeds into any fruit or green smoothie, stir them into your porridge, sprinkle on top of granola or spoon them into nut butter then spread the mix on toast, oat cakes or rice cakes. I sometimes add chia seeds to beaten eggs before I scramble them too. I love adding them to a Sunwarrior Protein shake too with 1/2 a frozen banana and some cinnamon. Add them to either your salad or soup or if you’re having some brown rice or quinoa pop in some seeds just as it finishes cooking and give it a good stir. you won’t even notice them there! Stir into your yogurt or my favorite CO YO – a lovely creamy coconut milk yogurt, make a chia seed pudding like the one above or if you are making flapjacks or oat cookies, stir them into the mixture before cooking. Can Progesterone help to Prevent Miscarriage? At first I didn’t know I was pregnant. My periods were all over the place anyway and it wasn’t until I felt tired and my jeans felt tight that i thought – ok perhaps I am! The problem with no knowing was that I continued to take my monthly dose of Tamoxifen. Once I found out I was pregnant I panicked big time and booked into see my specialist straight away. Knowing that I had taken my Tamoxifen when pregnant scared me. 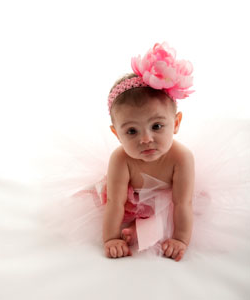 What if i had harmed the baby? He called me to the clinic, scanned me and told me that I would be fine. He also prescribed me some Progesterone suppositories to use for a month or so. The reason behind Progesterone is that they are said to be quite helpful to women in maintaining pregnancy if they suffer from low progesterone. Progesterone is basically the hormone necessary in the first three months or pregnancy which helps maintain the womb lining – and since I’ve suffered from a thin womb lining for years my specialist just wanted to make sure it stayed high enough to support the baby. So where there side effects? Who knows! You don’t exactly feel a million dollars in the first Trimester anyway. I thought I was holding water but again this could be down to the pregnancy not the progesterone. The bottom line is, my progesterone levels stayed high enough to maintain my womb lining, and it kept my baby safe. If you have had miscarriages in the past – then perhaps speak to your doctor or specialist about supplementing with hormone. A few studies have found evidence that taking progesterone supplements might benefit women who have had recurrent miscarriages, but right now the numbers are too small to say whether or not the findings are significant. However many doctors who choose to use this supplement say that this is simply helping the body with a hormone it’s already producing and there is no harm in prescribing them. It’s up to you to have a chat with them about your past history and decide whether its good for you or not. Good luck! The thing is, it makes it worse. How can you relax when you have appointments with a specialist every few weeks or when you couldn’t go to the gym and smash your body into the ground to relax (my weird way of unwinding!) – having a baby was constantly on my mind. I like to take control and for once couldn’t. The one thing I could do though, and did was change my nutrition and lifestyle. One thing that helped me dramatically was getting to bed before 10pm every night. Now I know this may seem a bit drastic for some but research suggests that the deepest and most regenerative sleep occurs between 10 p.m and 2 a.m.
To help me sleep and de-stress I feel in love with Magnesium Oil Original Spray. 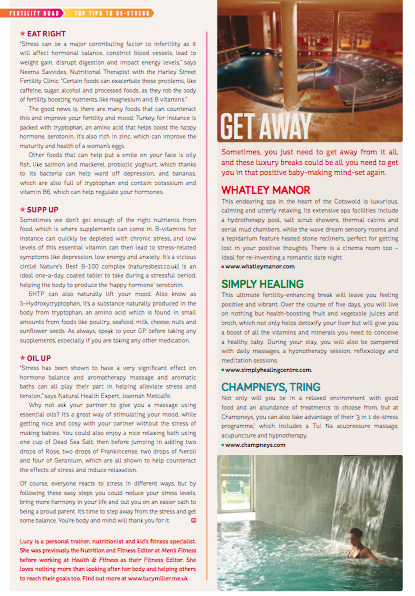 A few strays behind the knees before I hit that hay meant I had topped my Magnesium levels up – which is an essential mineral often referred to as the relaxing mineral because of its role in relaxing muscles. 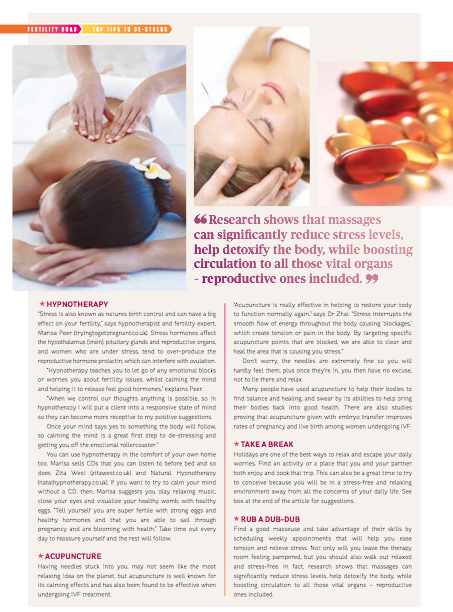 Magnesium also supports heart health, and helps to regulate heart beat and rhythm, which pumps blood to the whole body and the reproductive organs, meaning its a great mineral to aid with infertility. Review: Pregnancy Supplements That’ll Look After Your Bump! Back in December, I was prescribed Tamoxifen to help me fall pregnant. As explained in my very first post my body fat was too low to conceive due to too much training and a restricted diet plus my husband had testicular cancer nine years ago so we needed all the help we could get. Chemotherapy in high doses (Mark had it for four months – he stayed in hospital for one whole week every month and had an 8-hour dose a day and then did weekly day visits for a top up) kills the stem cells that produce sperm. He also had to have one testicle removed altogether due to the cancer, so as you can imagine we thought our only chance of having babies was through IVF. My specialist gave me hope and told me the Tamoxifen should do the job because Mark recovered well and was very healthy. So to compliment my Tamoxifen I stared taking a pre-natal supplement, to make sure my body had all the right nutrients. It’s important to start taking these a few months before you conceive because recent research suggests that they can help boost a healthy pregnancy and also help with healthy childhood development. They also contain Folic Acid, which is important right from the very moment your baby is conceived, because studies show that it can protect your baby from some serious birth defects, including spina bifida, a life-threatening spinal malformation. So here are my favourite Pre-natual supplements that I have experimented with over the past seven months. I started taking these back in December. Solgar is a brand I have always trusted and I took these until I fell in April. They have the perfect amount of vitamins/minerals, without exceeding 100% of RDA,except for Iron (which is supposed to be higher for pregnant women anyway) and Vit. C ( which doesn’t really have a toxicity level). It also had an adequate level of folic Acid, which as I said before is extremely important prior to conception as the neural tube develops in the first 30 days of pregnancy (before most women know they are pregnant) and supplementing folic acid can prevent many cases of neural tube defects. As soon as I found out I was pregnant, typically I had just run out of my Solgar supplement, so in a mad dash I ran to Revital, a local Health shop near me. They had run out of the Solgar also, so I spent a good half an hour scouting al the other supplements and came across Viridian. I went for this brand because it had a healthy amount of DHA, which I had read was vital for the development for the baby’s brain. You can get DHA from eating fish such as salmon, sardines and herring but what with my morning and afternoon sickness, the last thing I wanted was fishy fish! These did the trick and had everything in there that I needed! Since hitting my 2nd Trimester and getting my normal healthy appetite back (well sort of – I’m still off meat!) I decided to look into getting more specific supplements to suit that stage of my pregnancy. 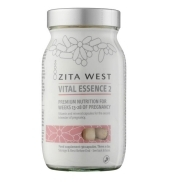 I knew of Zita West as I had read many of her books (which are amazing BTW) so I opted for her Vital Essence 2 supplement, especially for women in weeks 13-28. You take one, three times a day with food and they will then provide you with everything you need to safeguard your everyday diet, including 400ug of Folic Acid plus lots of protective ingredients such as Beta Carotene (a safe way to help support your intake of Vitamin A), Copper, Magnesium, Manganese and Zinc, all of which support normal cell division and help to protect DNA. I also brought her Vital DHA, which you have twice a day and contains Omega 3 essential fatty acids (EFA’s), plus a small amount of Zinc. I totally trust Zita West and her products, as she’s renowned for being a leading fertility and pregnancy expert, and a practicing midwife, acupuncturist and nutritional advisor. I love all her books and often see her in magazines and on the TV giving women (and men) fertility advice. So, I’m confident that my supplements are working well. I’m now 17 weeks and feeling fantastic and full of energy. I’ve had another scan, which reveals I’m having a baby girl and that she is very healthy and active. I’m on cloud nine! If you are anything like me and have hay fever yet are pregnant that you will probably be pretty miserable right now. A stuffy nose, tight chest and itchy eyes aren’t pleasant at the best of times, let alone when sleep and relaxation are at their most important and you keep waking up struggling to breathe. It’s a nightmare. So I have have been on the hunt for the latest products on the market that are safe to use when expecting. There’s got to be something out there for us – right? This salt water solution is designed to relieve congestion. Literally you stick it in your nostrils and squirt – and it can be used 2-6 times a day. Did it work for me? No I’m afraid not. My stuffy nose didn’t ease at all. In fact it felt like the solution just dripped straight out – giving me to need to use even more tissues. It was quite a powerful squirt too, so didn’t feel nice to use. 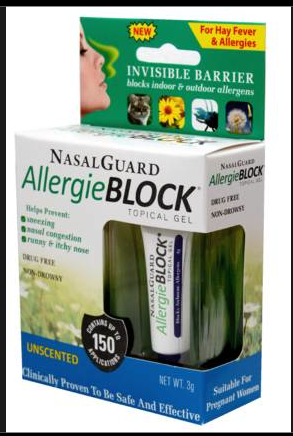 Similar to Vaseline, this balm is designed to trap pollen before it goes into your nose. You simply dab a little around your nostrils and your good to go. I loved that this was totally natural, had a lavender smell, which helped me sleep and the fact that I was in control of how much I used. I found this pretty effective but you do need to remember to reapply every time you blow your nose or sneeze, which was a lot to begin with! I found it most effective when I put it on in at night before bed, first thing in the morning before the gym and then straight away after the shower. I think this helped loads! I hear James Duigan is a fan too – which is always reassuring! I remember my husband got this for me in a state of emergency. We were supposed to be going to a wedding and I called him crying my eyes out and told him I couldn’t go. My eyes were streaming and my nose was so blocked it was making my few sick. Horrible. I think I got myself a bit worked up and all I wanted was a hayfever tablet but couldn’t just incase I harmed the baby. So he came home with this nose spray. It certainly helped clear things up but you need to stay on top of it and build it up. It’s not a miracle worker but it helps. The spray is supposed to line the inside of the nose, deactivate pollen and get to the root of the problem. It’s designed for pregnant women and kids so isn’t as strong as some things on the market but it did help ease some of my symptoms. The day of the wedding, I did a hot water inhalation and used this. Thank god it helped! 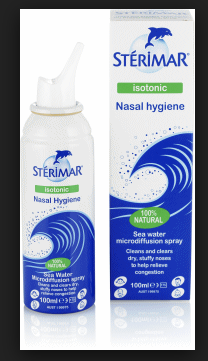 Again drug free and suitable for pregnant women and children, this really lightweight gel is designed to to block pollen entering the body through the nose and therefore preventing an allergic reaction. Like Haymax I found it really effective – and the best thing was that it was so light and transparent that I could wear it over my makeup and it didn’t look shiny or sticky. 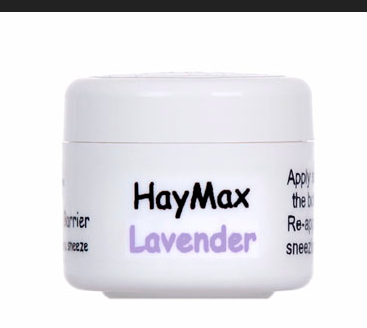 I found that I used the Haymax before bed, as the lavender helped me sleep, then used this throughout the day – reapplying every 4-6 hours. So far so good. My system is working and I can breathe again! Last but not least are my trusted eye drops. Made with from a sterile, preservative-free moistening solution for irritated eyes, containing the herb Eyebright – these drops are totally natural and have again been a life saver for me. 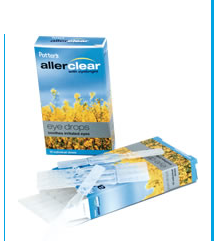 As soon as I feel even a slight itch, I whip them open and pop into my eyes and they instantly soothe them. You only get 10 packs per packet which make them pretty expensive but if they do the job and make you happy and comfortable who cares? 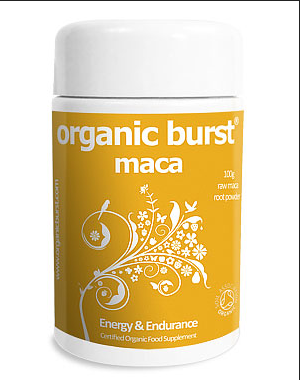 Maca Power – Magic Baby Dust? 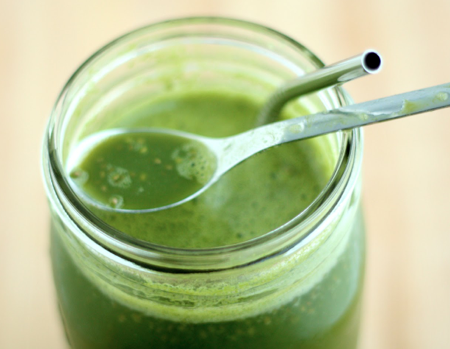 Have you ever heard of Maca powder? I hadn’t either until I read a book that sang its praises for helping to boost fertility. So guess what – I went and got some and started added it to my daily morning smoothies and sprinkling it on my granola and yogurt. Whenever I had the chance it was in my food and working it’s magic. Maca is basically a root-like cruciferous vegetable from the Andes of Peru. It grows in some of the harshest farmlands in the world, where the soil is rich in volcanic minerals, experiencing freezing temperatures, fierce winds and intense sunlight . It also has adaptogenic properties, which means it helps to strengthen the body so it is able to better resist disease and stress, support the adrenal glands and balances the body’s functions. This wonder-food has been scientifically researched for the use of increasing fertility since 1961 and has been shown to contain specific compounds called glucosinolates which directly can affect fertility for both men and women. I must admit I stopped taking it as soon as I found out I was pregnant because there have been no studies on the use of maca during pregnancy and as a safety precaution most manufacturers state that their supplements should not be used during pregnancy – it’s not worth the risk. But I’m pretty certain that this superfood really helped me regenerate my body and get everything back working again. 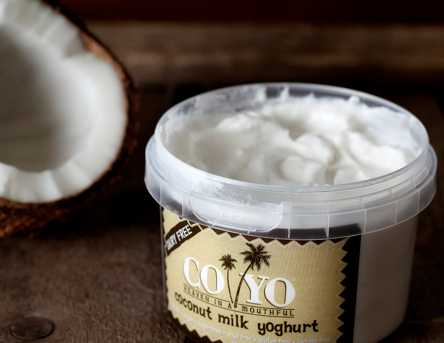 It has a bit of a taste to it – but it can be well hidden in smoothies etc so why not give it a go? As always, I would recommend speaking to your GP if you are on any medication and treatment as you don’t want it to interfere with anything – just a safety measure – but you should be fine. As explained in an earlier post, one of my first stops for aiding my recovery was KX Gym in London. 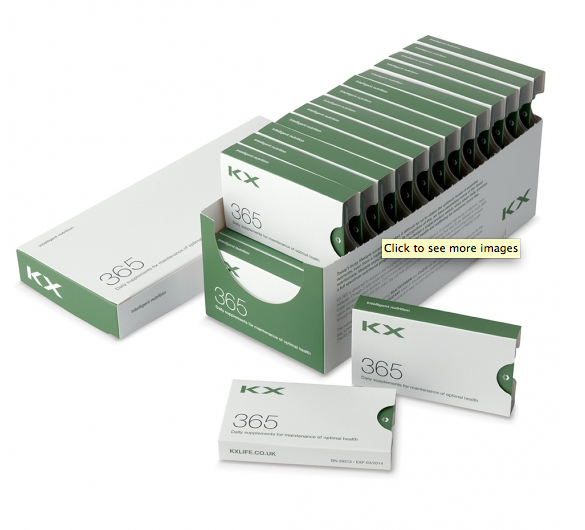 Gideon, my personal trainer prescribed me all sorts of pills and potions including the KX 365 supplements, which features a multivitamin and CoQ10 for the morning and an Omega-3 fish oil and Antoxidant tablet for the evening. But what does what? The CoQ10 is crucial for helping the body to generate energy. So this was perfect for helping me to maintaining my energy levels. The multi-vitamin then meant that I got all my B vitamins for energy too as well as vitamin’s D and C to support my immune system. The afternoon supplements, which were Omega-3 fish oils and an antioxidant, meant I got 660mg of EPA and DHA, essential fats – which help to support the heart and joints, whilst promoting muscle development, brain health and regulating hormones, whilst the antioxidant was perfect for helping me to cope with all the harmful effects of free radicals – those nasty things that cause the ageing process and disease. So there you have it. One month works out at £85 but this is literally all you need supplement wise for the month and makes supplement taking and remembering sooooooo easy!